The masses have spoken! When a pedal becomes a top seller for more than a decade to beginner, intermediate, and pro level players there is a reason why. DigiTech delivers everything from growling chunky rhythms, heavy grinding tones, all the way to amazing sustaining leads and everything in between. 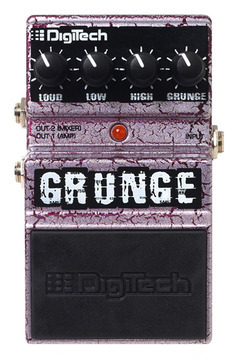 All this tone packaged in a rugged sturdy metal chassis that gives you full control over your tonal options with low and high EQ instead of the standard "one tone knob does all" that you find in other pedals. And to finish it off, you have the option of two outputs. The amp output goes straight to your amp and the mixer output has a special cabinet emulator built in so you can go direct to the mixing console or add a little extra beef to your tone in your amp. Find out why players all over the world have sought this pedal out for over a decade and see what you have been missing!